One of the loveliest waterfalls in the Republic of The Ivory Coast (or as it insists the world should call it “Cote D’Ivoire“) is “La Cascade” which is quite a fitting name since it simply translates from french as “The waterfall”. 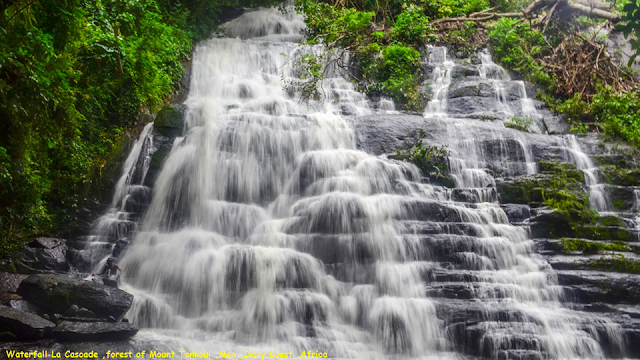 “La Cascade” (or “Les Cascade”) is located in the western part of the country just a few hundred meters on the road to Tonkoui (on the west outskirts of “Man”). The Town of Man itself is located 2 hours drive from the boarders cross with Guinea and Liberia. Recovering from violent instability Man is a place that many hikers are rediscovering, there are two Mountains overlooking Man – Mt.Tonkoui and Mt.La Dent de Man.